In the year of 2003, a rare printing error occurred in the Bangko Sentral facility where banknotes were being printed. 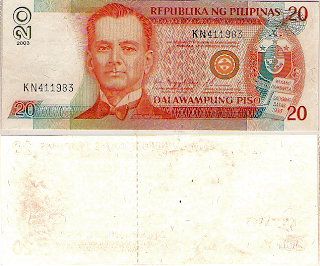 This affected the production of the 20 peso bill which resulted to some 20 pesos note's reverses to either exhibit light printing or totally lost the whole design itself which should have resulted to a uniface 20 peso bill. Other special errors were recently sold via Ebay, belonging to the same batch but one apparent error I have managed to save the images was a unique 20 peso note where a second printing of obverse occurred on the note's reverse which therefore resulted to overlapping images. Modern error notes rarely surface since the Mint are very strict and to stumble upon such kind of error is like winning a lottery. Apparently, uniface note is one of the toughest type of errors in collecting notes since Mint employees should have easily recognized the oddity and apparently destroyed it after being isolated. Luckily this note escaped scrutiny and now belongs to the exclusive collection of this site. One of the most colorful episodes of our history was during the Second World War. Though it was also one of the most chaotic yet, it was also the time when Filipinos showed their resourcefulness and innovations during the times of crisis. The Guerilla Note or War script was issued during War and it was authorized by the Commonwealth Government to finance the local resistance and underground war machinery. Guerilla notes were issued by several faction of resistance formed and established by the few surviving soldier from the Fall of Bataan and other battles all over the Philippines. Most of them were founded by American soldiers and Philippine Scouts. One of the most admired Guerilla movement was the Marking’s Guerilla, since it was created by two of the most colorful guerrilla leaders in World War II. They were, Marcos Villa Augustin (Marking), a former cab driver and boxer from Manila, and his deputy/mistress/wife/biographer Yay Panlillio, an American mestiza and former newspaper reporter. Marking's guerrillas formed in the Sierra Madre mountains east of Manila under Col. Straughn's umbrella, and became an independent organization when Straughn was captured in August 1943. Marking's organization developed a reputation for ruthlessness, and was often in open conflict with the Hunters ROTC Guerrillas, nearby. Fil-American Irregular Troops (FAIT). During the siege of Bataan, retired Spanish-American War veteran Col. Hugh Straughn was authorized by General Douglas MacArthur to organize the FAIT in the southern mountains near Antipolo, Rizal. As MacArthur left the Philippines and Bataan fell, Straughn extended his command to cover all of the area south and east of Manila. His was the only large, unified guerrilla command besides Col. Thorp's, and within the FAIT several other guerrilla organizations were born, including President Quezon's Own Guerrillas (PQOG), Terry Hunter's ROTC Guerrillas, and Marking's Guerrillas. When Straughn was captured in August, 1943, most of these organizations became independent under their respective leaders. Portions of FAIT remained in tact under nominal control of "Col. Elliot P. Ellsworth" (General Vincente Lim) in Manila, until Lim was captured. Straughn and Lim were both executed by the Japanese. 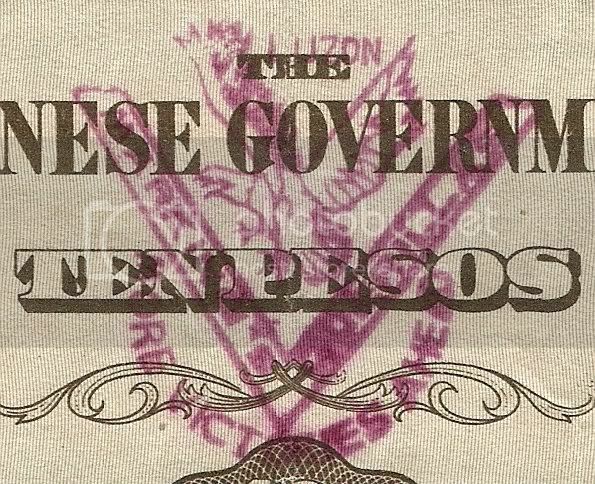 The Ten peso note was counterstamp with blue violet logo "Markings Guerilla and More Victories Ahead" with a Flying Eagle on top and the word "Luzon" on top of the Eagle.